So I am testing out the Stack Overflow for Teams (SFFT), and I ran into an issue. I removed myself as a member, (deactivated) and then had another administrator try to invite me again. When he checked on the invite status, it showed that the invite wasn't sent out. When I tried to access the team's page, I got the following message. Previously I was able to just type my email in there and I would be able to get back in. Any way to fix this? I cannot seem to figure out how to reverse this, I must be missing a step or two or something. I would like to apologize for making the question seem more urgent than it was. We were stumped trying to figure out how to add people back and forth. 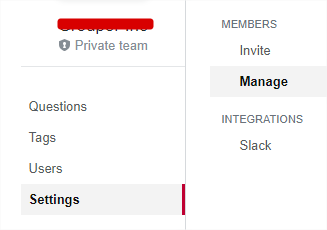 Here is the solution, once a user is added, they are always members. You just need to go to the Inactive menu option and Reactivate user. 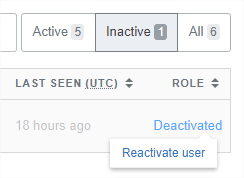 This should be fixed now; invites can be sent to inactive users, whether they were self-deactivated or deactivated by a Team Admin. When watching a tag, to which email address do you send the notification?